You can find us on Facebook, Twitter and Instagram, we even post the occasional video to YouTube! Follow & like etc below. Got a query regarding a camper or wedding hire? Please feel free to send us an email, and we'll get back to you ASAP, in the meantime please check our FAQ section below. Is insurance included in the hire price? Yes, all our prices quoted online and otherwise include ‘Fully Comprehensive Insurance’ within the UK for one driver. On request (Optional Extra) a second driver may be added to the policy providing they meet the necessary requirements set out in our Terms and Conditions. There is an extra cost for this service, please see our Optional Extras for more information. No, the insurance provided with the hire does not cover your personal possessions. We recommend that you take out travel insurance to cover this, as you would for any other holiday. Can I add an additional driver to the insurance? Yes, again discuss this with us at the time of booking or book an additional driver via the Optional Extras on the website. An “additional driver insurance form” will be sent to you via e-mail for your completion. Do I need to provide any form of identification when booking one of your campers? Yes, you will need to provide your driving licence and a form of identification that proves your age and current address. You will also need a valid credit/debit card in order that we can take an imprint of this, against the security deposit of £700. This will be deducted from your card until your safe return of our vehicle in an acceptable condition. This is very important as should you fail to produce any of the above you will be unable to take the vehicle out on hire. This is a stipulation from our insurers. I am under 25 years/over 70 years old with a full driving licence, can I hire your campervans? I am sorry you cannot hire one of our campers if you are under the age of 25 years. Maximum age is 75 years, and you must have held your full driving licence for at least 2 years. Simply discuss this with us beforehand and we will contact our insurers on your behalf. The insurance excess will be £800 for drivers over 70 years of age. Please see our Optional Extras for further information. I hold a full driving licence which is not issued in the UK, can I still hire your vans? Yes, we welcome visitors from outside the UK. Contact us beforehand and we will discuss this on your behalf with our insurers. The additional charge is £5.00 per day. 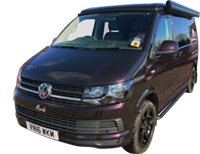 We ask that you provide your passport on collection of our campervan, as it is a stipulation from our insurers. I have points on my licence can I still hire one or your campervans? Yes, you can still hire one of our VW campers if your points are for a “lesser” offence e.g. speeding, providing they do not exceed 6 points. If your points are for a serious offence our insurer requires prior notification. Please contact us prior to booking if you are unsure and we will discuss your cover with our insurers on your behalf. Please see our Optional Extras for more information. What if I damage the camper or am involved in a road accident? Our main concern is that all of your party are ok. If you are involved in a road accident we ask that you contact the Police to report it and are guided by them in any procedures that are required. We understand that genuine minor bumps and scrapes can happen and do not want you to spend your holiday worrying about telling us! We ask that you contact us straight away, as this will not only allow you to continue your adventure at ease, but will also allow us to prepare for any repair to the campers on your return. Our vehicles have been subtly and sympathetically modernised to reduce the possibility of a break down. Our vehicles are fully covered by roadside recovery and relay. If however, the problem cannot be resolved quickly by these means, please call us and we will make arrangements to get you back on the road as soon as we can. You will have a telephone number in your campervan pack on which we can be contacted 24hrs a day. Can I safely transport my children in your campers? All campers are fitted with modern inertia reel seat belts on the front seats. On the rear seat there are two modern inertia reel seat belts at each side, and a lapbelt in the centre. Please bear this in mind if bringing your own children’s car seats, as larger car seats may not fit our campers. 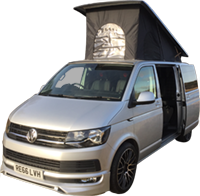 We would be delighted to offer you our booster and child seats (which meet British Standard regulations) which suit our campers should you require them. The child seats are suitable for children from 9 mths – 12 years old (9 – 36 kg) They have height adjustable head supports and side impact protection. The booster seats are suitable for children from 4 – 12 years old (15 – 35 kg). Please note that booster seats cannot be used with a lap belt. However, a child/booster seat can be fitted in the front passenger seat. The campers are not fitted with Isofix. Yes you are welcome to bring up to 2 well behaved dogs, we just ask that you bring some clean dog blankets with you to protect the seats. We charge an additional £30 for extra cleaning charges, not per dog. Can I bring my own bicycle? Yes, no problem. We can provide you with a four cycle bike rack. We can also provide you with two adult’s bikes at an extra cost. Please see our Optional Extras for further information. Can I take the camper anywhere in the UK or abroad? No. We are sorry but the campervans are insured for touring in SCOTLAND only. Can I take the camper over to some of the Scottish Islands on the ferry? Yes you can and we positively encourage this! You will have an amazing trip. Most ferries can be boarded on arrival. However, if you know your route it’s always best to book your ferry in advance with www.calmac.co.uk. Can I leave my car with you while I am away? Yes, you may leave your vehicle with us free of charge but at your own risk. What time can I collect and return the camper? You can collect your camper from 10.30 am on the morning of your hire. This allows you all day to enjoy getting to your destination! You MUST deliver your camper prior to 3.30 pm on the day of return. Please return the van by the agreed time. Please allow sufficient time to get back to our office so that you do not push the van too hard trying to get back in a hurry. If for genuine reasons you cannot get to us at the stipulated times, please let us know as soon as possible by telephone, and alternative arrangements may be made.